This is a simple folio, and not necessarily a full-blown case. The Smart Keyboard Folio hooks up to your iPad Pro magnetically. A series of new magnets are embedded within the back panel of the new iPad to make this work. These magnets hold the folio into place, but are still only magnets -- a sharp jolt from a fall still is enough to dislodge it. What has always made Apple's iPad-centric keyboard somewhat unique was the lack of any moving parts. There is no mechanical or butterfly mechanism moving the keys. The keyboard itself is made of fabric, which is stiffened and reinforced to form the actual key caps. When it comes to sizes and convenience when typing, there are two models to consider -- the larger 12.9-inch model actually contains a full-sized keyboard, same as the last generation despite it being physically shrunken down. Apple trimmed up the extra space on the sides, retaining the full-keyboard size. The 11-inch model in comparison is a bit more cramped, and certainly a tough experience. With the 12.9-inch, it feels -- other than the material -- similar to typing on your Mac. Because of the space constraints, the 11-inch isn't a full-sized keyboard so muscle memory is a bit harder to transfer. I've spent a lot of time typing on the Smart Keyboard over the past couple years and I enjoy them a great deal. They only have subtle audio feedback and don't have a super satisfying click to them, but they are quick and responsive. Because the amount of key travel, the Smart Keyboard Folio actually feels not too dissimilar to the butterfly keyboard on the Mac. The Smart Connector is how the Smart Keyboard Folio connects to your iPad Pro and draws power, meaning it never needs to be plugged in and charged on its own, unlike Bluetooth models. Apple didn't just shrink down their existing keyboard for the smaller 12.9-inch iPad Pro, they instead took this as an opportunity to try to improve upon it. The best change the made was simplifying the experience. Propping up the iPad into typing mode is as easy as opening the folio and tilting the iPad back, which then locks into place, again using magnets. Instead of being limited to one orientation for typing, there are two angles the screen can be placed at. What amounts to the biggest improvement for us was the increased stability. The previous model had a top panel with the hinge. Flat surfaces were no issue, but trying to type on your lap or the armrest of a couch were tough to do. It was also difficult to pick up the iPad while open in typing mode from the edge of your keyboard, again due to that hinge. The new model has a completely solid top which fixes all of those complaints. And yes, the new model also comes with some back protection, thus making it the folio rather than just the keyboard. While Apple has succeeded in making a number of improvements, they've also introduced a number of new downsides. The first downside, which is more likely a personal issue, is the back protection. We take our iPads everywhere. We travel a lot and are always bringing them along for the ride, often with the original Smart Keyboard in tow. After a year of doing that with our second generation iPad Pro, there are still no scratches or scuffs on the back of our iPad. We are disappointed Apple is forcing the back protection upon us for this product which adds unnecessary weight and thickness to the combined unit for not enough in return. The new iPad Pro and Smart Keyboard Folio weighs more, and is thicker than the old iPad Pro and Smart Keyboard combination. This is a strange choice given that the the new iPad Pro by itself is thinner than the previous year. We'd have preferred an optional implementation. Perhaps one with a separately sold magnetic back panel to go with the Smart Keyboard. Another issue we had was when folding the keyboard back behind the iPad. This happens a lot when we just use it as a tablet and aren't using the keyboard or propping it up. On the old model, you had a panel of microfiber against your hand which supplied more grip. The new one feels awkward when holding. To compound things, those keys facing backward actually makes the iPad slide a bit in this situation when sitting on different surfaces. The previous microfiber helped it stay in place. Many times we pick up our open iPad, set it on our Mac, and walk around the house or office. The combination now slides around while in transit, rather than staying put. Our biggest complaint is the more vertical viewing mode. The old iPad Pro had two modes -- a typing mode with the keyboard out, then a viewing mode that tucked the keyboard away and positioned the iPad at a steeper angle. This was convenient to use with a small footprint in a variety of scenarios and took up very little space. On the new iPad Pro with the Smart Keyboard Folio, you still have this more vertical angle, but you have the keyboard out at the same time. This ends up occupying a large amount of unnecessary space. Since we've started using the new model, it has been exceedingly frustrating to use and we wish Apple didn't remove the capability. Regardless of all our complaints, the Smart Keyboard Folio remains the best typing experience on iPad. The keys are quick, responsive, and easy to type on. They aren't as satisfying as some dedicated keyboards, but once you adjust, you can touch type as quickly and as accurately as on your Mac. We're hoping that manufacturers are rushing to bring their own keyboards to the new iPad Pros -- but aren't optimistic given the dearth of options for the iPad Pro. But, with any luck, Apple will be dethroned by a newcomer this year. The Smart Keyboard Folio is available to order now from Apple authorized resellers Adorama and B&H for $179 (11-inch) and $199 (12.9-inch). For the latest iPad deals and product availability, be sure to visit our iPad Price Guide. I’m curious how anyone could use a physical keyboard without a trackpad. It would drive me nuts. I have to agree with the writer on the viewing angles. That said, I ordered a keyboard folio with my new iPad 12.9 to give it a test run even though I did not purchase the keyboard folio with my 2017 model. I just used an Apple Magic key board that I carried along with it because I hated the feel of the keys on the old Smart Folio. The keys on the new Smart folio feel much better. I also like the fact that the new folio now covers both sides of the iPad and doesn't have the odd lumpy look of the previous generation. When I'm using my iPad as jst a tablet, I tend to detach it from the folio. I have always loved that aspect fo the smart covers, ditch the extra weight and just tablet out. That is something you cannot easily do with any of the other 3rd party cases I've seen. My iPad 12.9 remains my goto mobile platform and this keyboard folio addresses my needs on the go. "I’m curious how anyone could use a physical keyboard without a trackpad. It would drive me nuts." The touch screen is the trackpad. Check out Microsoft's Surface Book and Surface Studio. They take a completely different approach. Does either the smart folio or the smart keyboard folio benefit the pencil in any way? I have to say, I'm disappointed in this review. I don't own the product, but the review itself seems overly harsh and based on nothing but personal preference. It's fine to say you preferred the old configuration for the keyboard, but to give the product 2.5/5 stars? Literally every single "con" of the review (for which I assume it was marked down) is a pet peeve. Does the product function well? Does it perform as advertised? Is it priced correctly? Does it have any bugs? How does it feel? That's what it would be based on...not personal preference. The missing ability to fold the keyboard out of the way is really a negative for me on the new design. I use my iPad Pro/Smart Keyboard in that configuration a lot. Not just to stand it on a table, but also it makes a very nice handle when carrying it around to do site surveys. The camera is unobstructed in that mode, so I can take and insert pictures into my notes and then annotate directly on them. I don't like taking the keyboard off while I'm doing this because then I have to set it down while I work and keep track of where I put it. Right now, I can walk an entire facility with just my iPad Pro (w/Smart Keyboard) and Apple Pencil. I'd like to upgrade to the new model, but one thing that has me waiting is to see what the 3rd party vendors come up with in this regard. I think you criticisms are completely fair. They are personal preferences, but I think those matter greatly. When I say I really enjoy typing on this keyboard other reviewers may hate it. That’s a personal preference. As is how it feels. My criticisms come from a lot of use of this product, more so than most other reviewers out there who solely use the keyboard during a brief review period. These criticisms can be make or break for some people. After using the previous Smart Keyboard about every day for two years, this new model has me looking for new options. I’d consider that relevant for a review. I have the 11” iPad Pro with Smart Keyboard Folio. I also had the 10.5 iPad Pro with the Smart Keyboard. We all have our own opinions - and that’s a good thing. Mine differs wildly from the author’s. - keyboard section seems stronger and stiffer - if you are silly enough to pick the system up by that protruding keyboard section, the old system would bend a lot, whereas the new one does not. I would rate the old solution for the 10.5” at about a 6/10 (light, thin, decent key action) - whereas for me the new solution gets an 8/10 (to me pretty much all the same benefits of the old one, plus vastly more solid in use, with more viewing angle options). I agree the fold over with keys facing outward is kind of odd. But the two sides join quite solidly, again via magnets, and the keys are reliable in not being active, so i just accept them as grip - or pull it off and put it in my bag if mobile, or to one side if at home. I agree vastly. I’m going to miss this. I wish someone would make a third party Smart Keyboard that mimics the original Apple design. The Surface Book has a trackpad. Since the Surface Studio is a desktop, the vast majority of people likely use a mouse with it. There are times where their users would use the touchscreen, but it’s more of a feature add-on than the native way people use those devices. I was resisting the sarcastic remark to rogifan, but... all of computing since sometime before 1984 or so used computers without trackpads, without mice. Man, the tab key was used a lot for deployed DOS apps. You can still see some of this UI style today, like in hospital software. A lot of hospital workers are carrying these fully modern touchscreen 2-in-1 laptops, but they end up entering information in a character based UI system built from 30 years ago. I can’t imagine what type of Frankenstein’s monster they have for the backend. Now, it’s only used to begin paragraphs, for those who choose not to have a new line separate paragraphs. The iOS software keyboard on the 10.5 doesn’t even have it as a default key, and I don’t think it is even available for a text field key in web browsers. I've never experienced that feeling of buying an Apple product only for an updated version to be released within a month or two. When I needed to replace my iPad Air earlier this year I took a gamble on the 10.5" iPad Pro and Smart Keyboard not being updated. When I heard that the iPad event was coming I thought I may get that feeling of wishing I'd waited a little longer. Then I saw the prices and the redesign of the Smart Keyboard. I like the old Smart Keyboard a lot but I never liked that bump where the keyboard folds in and find it a little fiddly to fold out, especially into "media viewing" mode. This review confirms all the things that I felt were wrong with this version of the Smart Keyboard. I'm actually happy that I bought early and missed out on the update. I was waiting for a Mac mini update so I could replace my 6 year old Windows 10 desktop but the updated mini is far too expensive for what I'll use it for so I'll replace my desktop with another Windows 10 PC but that's another story. Yes, but this is exactly what Phil said was the reason they weren't making a touch screen Mac. Lifting the arm to touch the screen wasn't an ergonomic solution. So when the iPad is used in the exact same manner, suddenly it's acceptable when lifting the arm is a constant activity, whereas it would only be an occasional thing on a Mac? I have the 11”keyboard and use the iPad in “tent mode” for media viewing. When in that configuration, the screen rotates 180 degrees and the keyboard is facing backwards. The only real downside is ensuring that the contact points are on a surface that is not slippery, e.g., wood vs. glass. When I got my iPad Pro a year and a half ago, I looked at Apple's keyboard and ended up getting this one from Logitech. It has nicer keys, is backlit, includes function keys, can be positioned at any angle and the keyboard easily snaps off when you don't need it. It even has a spot for the Apple Pencil. I don't know if they will have a similar product for the new iPad Pro, but I hope they do. What Apple said is true. Touching a vertical screen, be it either a desktop display or a laptop display, is a terrible experience. At best, it should only be used as a complimentary input, which indeed it is for touchscreen clamshells. They should not produce a Mac laptop with a touchscreen. They may produce a tabletop touchscreen device in the future, but that will be a device that is flat on a table or inclined like a drafting table. 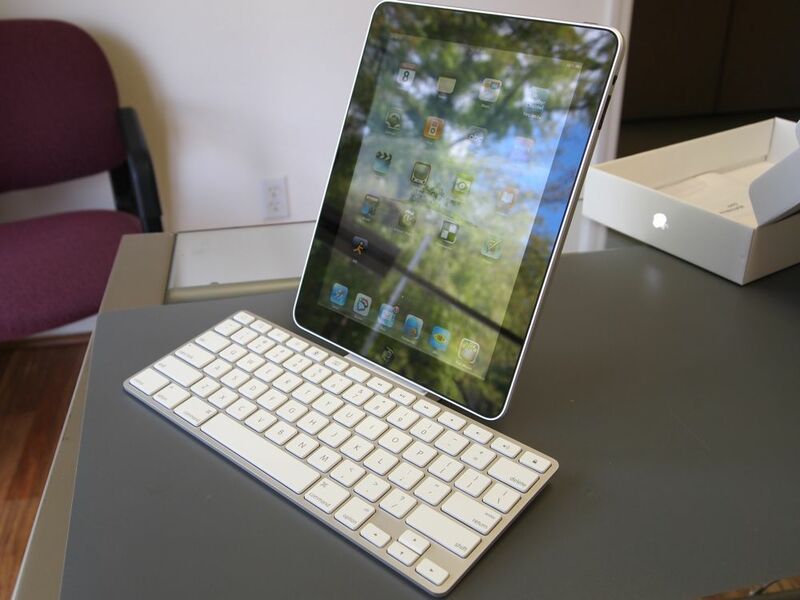 This was the Apple keyboard dock for the very first iPad in 2010. Apple was thinking of shipping an iPad with two 30 pin ports, likely so that they could dock it in landscape. So, a certain niche of folks really want a hardware keyboard, or Apple perceives that they have been necessary since the very first iPad. Most people should be using the software keyboard, and Apple should be putting a lot more effort into optimizing the software keyboard. I think it would be more beneficial for Apple to advertise the iPad with its onscreen keyboard a lot more, and leave the keyboard accessories to 3rd parties. Their focus really should be the capabilities of the onscreen keyboard. Excellent point. Apple clearly hasn't figured out the usability solution for the iPad as a laptop replacement. Windows addressed the problem by making their tablet a laptop with some weak tablet use cases. Apple is making the iPad a tablet with some weak laptop use cases. I sometimes wonder if there really is a good solution for this, but my opinion is that Apple should add a trackpad to the iPad keyboard and have it work only for text editing and for apps that specifically support it. I think that would add a TON of usefulness without many downsides. But, unfortunately, I'm not in charge at Apple. The review doesn’t match my, perhaps more modest, experience. I couldn’t use the previous version of this keyboard, and instead used the very heavy duty and clicky Logitech one, which was great. So I waited to try this new version of Apple’s keyboard case in the store, even after I had ordered the new iPad Pro. And I t’s so so very much nicer to type on than the old on. There a nicer feel to the material and a nicer feel to pressing the keys. I bought it immediately. It fits the iPad solidly and perfectly. Basically I love using it completely. For me it’s a 4.5 out of 5, no question. I have found that there are some things for which a tablet works quite well, others not so much. I agree with the other commenters, though - no one has found a good balance between the two. What I found using my iPad Pro w/keyboard was that I use a lot of keyboard shortcuts, so I don't need to touch the screen much. As such, it's not such an issue with the usability. The big compromise with a tablet is the fact that while your finger is conveniently attached to your hand, it's not very precise, so things like text selection tend to be rather cumbersome. iOS would need a significant upgrade if it were to allow trackpad or mouse input, though. Rogifan - clearly a tablet isn't for you! I also find lifting my hand from the keyboard to use a mouse annoying, so I tend to use keyboard shortcuts as much as possible. The interesting thing I have noticed, though is that after using my iPad for a while, I find myself reaching up and touching the screen on my MacBook!